I have been fishing for catfish for some time but it wasn’t until I took a trip to the UK that I discovered what a thrill carp fishing can be. Not only di d I discover a whole new quarry I discovered carp rods, reels, tackles and gear I had never see in the United States. After spending my entire life fishing all over the United States, I was shocked to discover that some of the best bait fishing and shore fishing gear in the world was being used by European carp fisherman. In the United States, carp fishing and cat fishing go hand in hand. Few cat fishing holes don’t have carp swimming through them and carp fishing tackle, rods and reels can put catfish on the bank faster than you’d imagine. Not catching a catfish is the challenge when fishing for carp in the US. Most Europeans don’t appreciate what a thrill it is to catch a mess of cats, nor do they appreciate what amazing cat fishing gear they have. 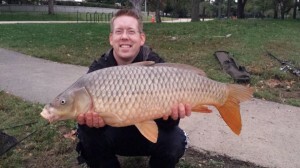 Likewise, American’s don’t realize that one of the biggest and best game fish in North America is the carp. www.catsandcarp.com takes the best of both these worlds and shows you everything you need to know to put a lot of catfish and carp on the bank using American and European tactics. If you love cat fishing but you have wondered what it would be like to land one of those 30 lb carp you see swimming around your favorite hole, then catsandcarp.com is for you. If you are a die hard cat fisherman or carp fisherman we got the tips, videos, product reviews and news that you are going to want. We guarantee you are going to learn something new. Luke Nichols is a born-and-raised Alaskan. He was too young to remember his first fishing trips. But he learned to fish watching his father, grandfathers and older brother catch salmon, trout and char. 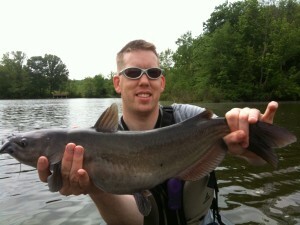 Fishing addiction followed Luke to law school where he targeted the trophy catfish that haunt the Mid-Atlantic region. Luke also began to write; publishing his first paid fishing article. His first carp was caught on a four-weight fly rod from a decorative koi pond on his college campus. Luke was converted to carp fishing during these legally dubious early sessions. Luke began experimenting with Euro-style angling techniques after buying a second hand 1980’s British fishing video. After some years and two trips to the UK, Luke is a zealous modern carp angler who has no qualms about using European techniques to land big catfish. Luke is a pro staffer with Carppro and writes for Carppro Magazine. Most mornings Luke can be found reeling in a few cats and carp from Occoquan reservoir. However, his happiest fishing trips involve his young boy and beautiful wife, Rebecca.